As I pulled up to a stop light the driver in the next lane made a frantic “roll down your window” pantomime. He looked desperate. Now, rolling down your window in New Jersey for someone you don’t know is sometimes not a very good idea, but I took a chance and he quickly blurted out a question. “You going to the fly fishing show, right?” he asked. “You mind if I follow you there?” I said sure then asked him how he knew I was going to the show. “So where would someone with Virginia plates and a fishing sticker on his window be going in New Jersey today?” he said. “Look at your hat. There’s a fish on it.” The light turned green and followed me to the Fly Fishing Show in Somerset, New Jersey. The parking lot was packed and I could see people walking out with packages and all sorts of other fishing goodness while other folks were lining up to get in. 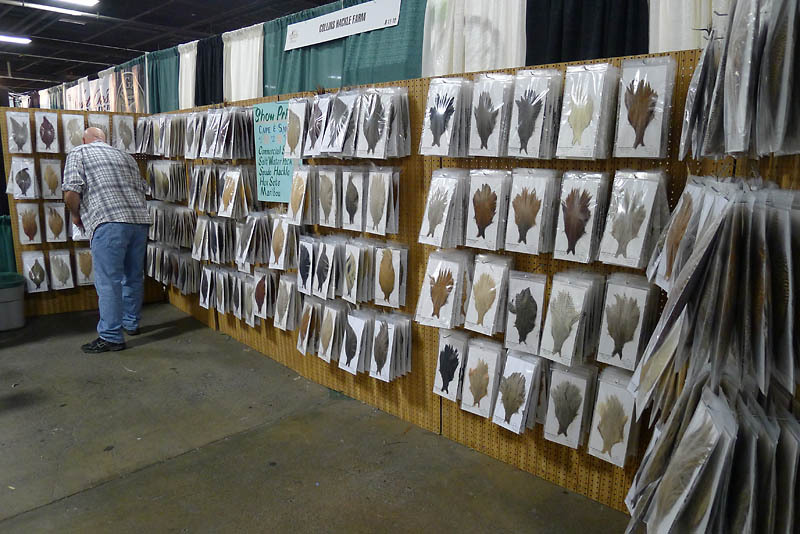 There were a lot more booths and vendors than in previous years. Most of the major rod, reel and clothing manufacturers were set up for business as well as the big name outfitters and adventure travel folks. There was also a good number of the not-so-big names--custom rod builders, rod companies and makers of reels and accessories that are not yet a familiar name brand but may soon be. There were no big surprises at the show. Beulah rods will be coming out with a new line of “flats rods” in May and folks were lining up at the casting pond to try out the new Sage Circa sticks or the new Orvis Helios 2 rods. And almost every rod manufacturer had a lineup of switch and spey rods in all the popular lengths and weights. 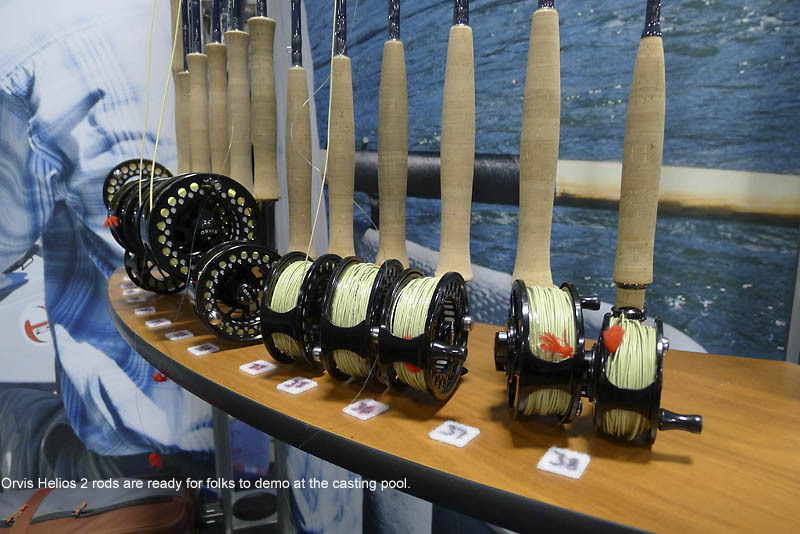 Both Abel and Cheeky Reels had a colorful display of their new anodized models while Hatch and Nautilus looked cool just dressed in satin silver. 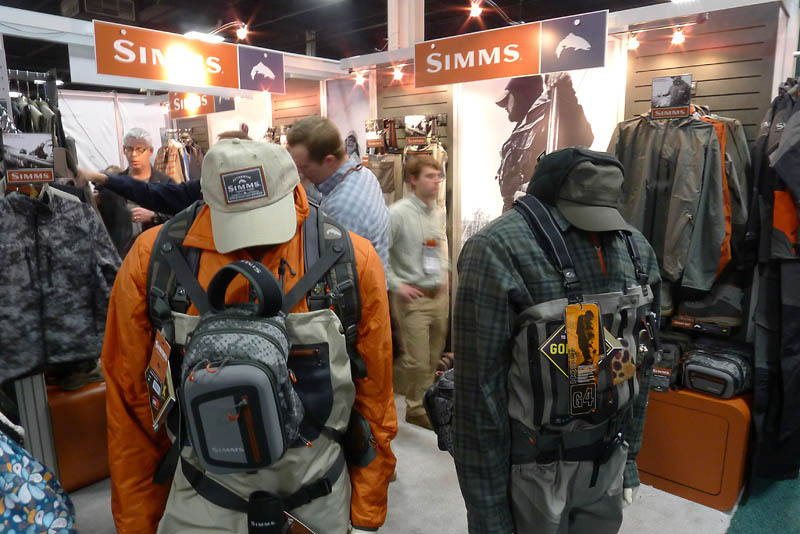 For anglers who want to go into stealth mode, Simms and Orvis showed off a digital camo line of clothing and accessories in various shades and colors. After making a couple circuits around the floor I stopped off at the casting pond to rest and watch folks test-cast rods. Some people could cast a beautiful line while others might make the police classify a fly rod as a deadly weapon. One pond marshal caught someone trying to tie on a REAL fly (with hook intact) instead of using the bit of yarn and I heard the dreaded whizzing sound followed by a loud slap as the marshal I was standing next to was hit by a low-flying backcast. But it was also a treat to watch Lefty Kreh step up and give instruction to a novice caster who was trying out a TFO rod. After giving a few basic lessons on loading the rod Lefty took the tip off the rod then fired off a cast that went the length of the pool--about 80 feet. I also stuck around for a lecture by Andy Mill, former Olympic downhill skier and five-time Tarpon Gold Cup winner, on how to hook and fight large saltwater fish. Mill covered fly presentation, casting, reel drag setting and fish-fighting techniques.